The large villas are completely furnitshed for 8 guests and all have a private pool (pools are open from May - September). Although this area is well loved by cyclers, many people who stay in this area love to play tennis, jeu-de-boules or to swim in the communal pool which is open from May 1st - September 27th. All villas have Wifi internet and the Dutch managers of the parc speak several languages. In the close area of the parc are all facilities for the holidaymakers. The beautiful nature is worht exploring and there are many hiking trails close to the parc. The environment is great for cyclers, the famous Mount Ventoux is close, this makes the parc great for bike lovers. A must see is the city of Avignon, once the city of the pope and now the capital of the department Vaucluse, is at only 25 kms from Saumane and truly a beautiful city to visit. Gordes is certainly recommended highly, due to it's unusual location on the rocks, it looks if the village slides down from the rocks any moment. Allure Villas France also highly recommends the Domaine Les Rives de l'Ardeche. This Domaine has a great ambiance! 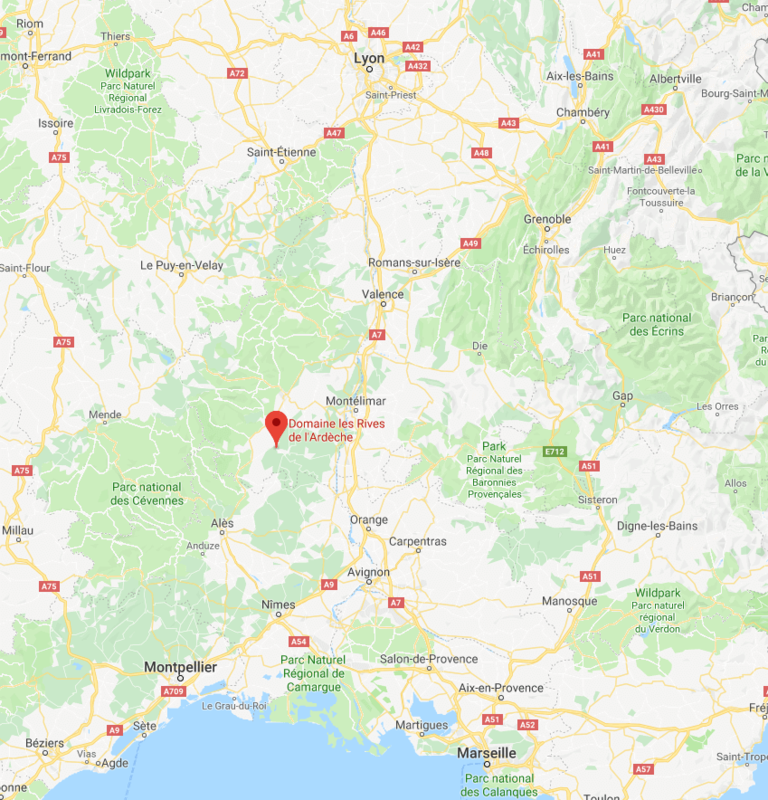 The parc is located close to Vallon-Pont-d'Arc and is on the side of the river l'Ardeche. The parc has approximately 100 villas, with and without private pools. The parc has tennis courts and jeu-de-boule courts for the guests' use. There is also a large communal pool and a lovely pool area at the entrance, where you can buy a refreshment or a small snack, and a small childrens play area. Allure Villas France welcomes the guests at the reception and the manager of the parc will take you to the villa from there. We offer villas for 6, 8 or 10 persons, with or without private pool. All guests can also use the communal pool. The surroundings of the parc are great for cycling and hiking, the beautiful nature of the Ardeche is worht seeing! We can recommend the hiking trails of Montagne d'Ardeche in spring and during the summer. A lot of cosy and pittoresque villages are in this area for you to discover. Beside the lively village Vallon-Pont-d'Arc, the villages Ruoms and Joyeuse are worth a visit. With the river so close to the Domaine, this is a gaurantee for a lot of water fun! Rent a kayak and explore the river and the rocks along side. Ask for the possibilities at the parc manager. A great day trip is to visit one of the many caves in the area. 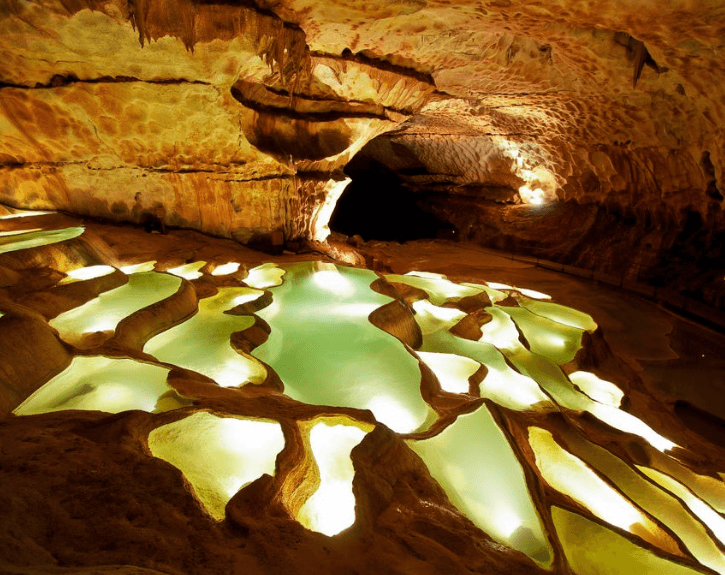 The fairytale cave of Saint Marcel d'Ardeche is a must see. This cave has an exceptional long underground network of corridors (46 kms! ).